In Rethinking EU Consumer Law, the authors analyse the development of EU consumer law on the basis of a number of clear themes, which are then traced through specific areas. Recurring themes include the artificiality of the EU’s consumer image, the problems created by the drive towards maximum harmonisation, and the unexpected effects EU Consumer Law has had on national law. 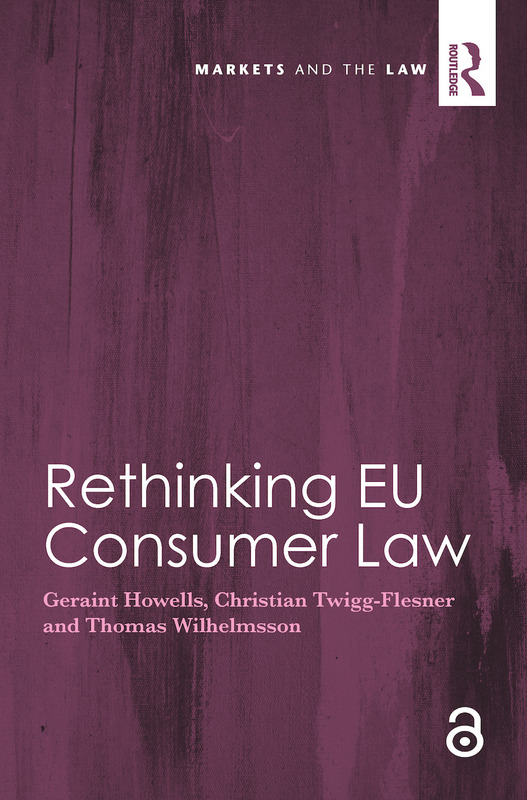 The book argues that EU Consumer Law has the potential of enhancing the protecting of consumers throughout the EU and could offer a model for consumer law elsewhere in the world, but in order to unlock this potential, there needs to be a rethink with regard to the EU’s approach to consumer law and policy. Geraint Howells is Chair Professor of Commercial Law and Dean of the Law School at City University Hong Kong. His expertise covers consumer law and product liability, consumer safety and tobacco regulation, and he has written, co-authored and edited many books and journal articles. Christian Twigg-Flesner is Professor of International Commercial Law at the University of Warwick. He has expertise in Consumer Law, the Europeanisation of Contract Law, the digital revolution and contract law, and the harmonisation of commercial and contract law. He published widely on EU Consumer and Contract Law. Thomas Wilhelmsson is Professor of Civil and Commercial Law at the University of Helsinki. He was Counsellor of Legislation at the Ministry of Justice 1979-1981, Head of Department of Private Law 1989-1998, Vice Rector of the University of Helsinki 1998- 2008 and is currently Rector of the University of Helsinki. He is an expert in consumer law and private law.